Twenty-seven year old Duran Caferro contrasts his aggressive boxing skills with an unassuming personality. Even Caferro’s tall, lean physical appearance comes across as deceptively modest. When he stepped into the arena at the Three Forks Rodeo Grounds on Saturday, August 22, to exchange grunts and punches with a gutsy journeyman named Omar Avelar, spectators saw that Caferro’s mild demeanor outside the ring masks a raw power that kicks in after the bell. Pro boxer Duran Caferro, fighting as a welterweight, Three Forks, Mont., Aug. 22. Having slipped and lost his balance due to water on the canvas, Avelar was unable to come out for the third round. The technical knockout victory bumped Caferro’s professional record to 14-1, a register largely built up by defeating the customary trial horses a young fighter is expected to face. Avelar came into the chilly night of the scheduled eight-round USA Montana State welterweight title fight (150 pounds) with a 3-14 record. But statistics seldom tell the whole story. The 25-year-old Avelar was anything but a guaranteed spoon-fed win. Although Caferro had previously earned a unanimous four-round decision over Avelar in August 2013, Avelar fought unintimidated. The first fight between Caferro and Avelar took place at 4 Bears Casino and Lodge in New Town, North Dakota, and Avelar was the crowd favorite. But in Three Forks, the crowd went unmistakably for Caferro, cheering each and all of the Helena fighter’s exciting flurries— the Caferro-Avelar contest being the main event of a bone-crackling show of 8 pro and semi-pro fights. 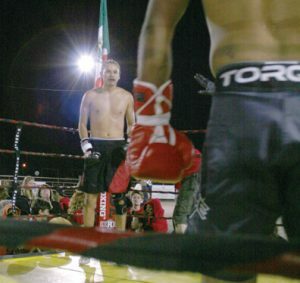 Also featured that night was Mexican fighting legend Luis Ramon “Yory Boy” Campas, who battered a game Chris Asher, of Bozeman, recording a second-round knockout with a right hook to the body that put Asher on the canvas. Caferro dropped Avelar in the first round, but Avelar was not severely hurt. Caferro found Avelar easy to hit with everything he threw, but he could not connect hard enough to suppress Avelar, who may have been too game for his own good. Caferro said he was disappointed that Avelar was injured in a freakish slip—and so, too, was the crowd of approximately two hundred and fifty. The moisture-speckled canvas, on which drops of water appeared during the fights that night, deprived fans of several more rounds of tense boxing, the water being the possible result of condensation from unseasonably moist air and falling temperatures. Outside the ring, Caferro’s eyes give off the quiet confidence of a man who has almost forgotten what it is like not to think and breathe boxing. And when Caferro smiles that ingratiating smile, there is just enough of a sneer to hint at the cruel realty of his fists. Caferro entered the ring that night after a long walk across the arena, his entourage in tow, as a sound system blared the haunting chants and beat of his Native ancestry. His entourage included local children and his seven-year-old son. He said that, even leading into the heat of battle, kids contribute to an aura of serenity. As someone who has been boxing throughout his life, Caferro tries to pass down the values and social lessons of the sport. While Caferro comes from modest circumstances—his mother is half-Northern Cheyenne, half-Southern Cheyenne, and he is an enrolled Northern Cheyenne tribal member—his past is not filled with tales of deprivation. He advocates the virtues of family and community and has been praised by Native groups who have recognized his work with youth. After an exceptional amateur career, Caferro turned professional in the summer of 2012. Since then he has fought 41 rounds in 15 bouts, taking the fight to his opponents—and to the box office. Clearly, Caferro fights in the finest tradition of the sport. He is a quick, flashy fighter with long arms and smooth delivery. Given enough time and exposure, he believes he can obtain the stature he deserves. Looking ahead to a potential fight in Kalispell in September, and another in Helena in the fall, Caferro said he is in the sport to advance. He doesn’t plan to end his career with a sparkling record and no title. He doesn’t want to slide past his prime and become a human notch in the ring post of boxing—he wants a championship, and a major test, soon. And if not now, when? Brian D’Ambrosio is the author of Warrior in the Ring: The Life of Marvin Camel, Native American World Champion Boxer (Riverbend). His next book, Rasta in the Ring (McFarland) details the life of Rastafarian boxer Livingstone Bramble.